Laser skin tightening utilizes laser light in the infrared spectrum to heat up the collagen underneath the skin through a bulk heating process. This bulk heating of the collagen causes collagen denaturation and results in new collagen formation. This procedure is excellent for people who are starting to see saggy jowls or for those with loose sagging skin on the neck. What is the laser skin tightening procedure like? The laser skin tightening procedure takes about 45 minutes. You will be asked to cleanse your face thoroughly. After a series of pre-treatment photos are taken, a thin layer of cool gel will be applied to your face. A cooling device, similar to a cold blower, may be used to cool your skin. Then the laser light will be applied in a series of pulses to the treatment area. 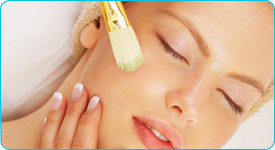 After the treatment, we will apply a post-treatment laser cream and sunblock, and send you on your way. You will generally not see results until the 2nd or 3rd treatment. The process of new collagen formation takes about six months, so the final results of the procedure will be realized six months after the completion of your treatment regimen. Ho w many treatments do I need? For the best result, you should come regularly once every 3-4 weeks, for 4-5 treatments. We recommend maintenance treatments at least once a year. The best candidate is someone with loose, thin skin around the jowls and neck. When you pinch the skin or feel the skin, the skin feels loose and doesn’t bounce back too quickly. Usually patients age 40-55 are good candidates for this procedure. This procedure does not replace a facelift and is not recommended for someone in need of a facelift. Laser skin tightening works on about 8 or 9 out of every 10 patients. This means 1 or 2 patients may not respond. Yes, laser skin tightening can be done in the same session as a photofacial, a laser freckle removal, laser pore tightening, and many other facial laser procedures. The different procedures can work together synergistically to produce an even better treatment result. Can we do laser skin tightening over Botox or a dermal filler? Yes, you can get this procedure done even if you have Botox or a dermal filler. If you want to get Botox or a filler done, we recommend that we do the laser procedure first, wait one or two weeks, then do the Botox and/or filler afterwards, then wait another two weeks before doing another laser skin tightening procedure. You must wear sunblock after any laser procedure and continue sun protection o prevent any additional damage to your skin. You can take a daily multivitamin to help nourish your skin and promote healthy skin. We have an excellent product called Neocutis, which contains growth hormone to promote collagen growth and is used for anti-aging. Regular facials, which include a facial massage, can help to stimulate collagen growth during this treatment as well. For more information, please contact our office at 832-300-5593, email us at questions@medispainstitute.com, or visit our website at www.medispainstitute.com.